When it comes to robotics companies in the Boston area, there’s iRobot—and then there’s everyone else. IRobot (NASDAQ: IRBT) makes up a big chunk of that economic activity. The Bedford, MA-based firm reported nearly $617 million in sales last year—more than a third of the total robotics revenues generated by Massachusetts businesses in 2015. IRobot employs more than 475 people in the Bay State, the report said, making up 10 percent of the state’s total robotics workforce. The study, released Tuesday, was conducted by New York-based ABI Research for the Massachusetts Technology Collaborative, a public economic development agency. The report noted that the state’s robotics sector is “healthy and growing”—33 new robotics firms were formed between 2011 and 2015, a 57 percent increase from the number of robotics startups created in the previous five-year period. New startup activity could continue, especially given investors’ larger appetites for funding such ventures. Global robotics investments grew steadily between 2011 ($149 million that year) through 2014 ($341 million), and then spiked in 2015 to nearly $1.5 billion, the report said. Last year’s figure included more than $190 million in venture capital and private equity invested in Boston-area robotics companies, the report found. But one big takeaway from the report is that despite all the hype and increased investments in robotics over the past several years, the local sector is still relatively small. Consider that the state’s largest IT firm, EMC (now officially called Dell EMC), generated nearly $25 billion in sales last year; and one of the state’s largest life sciences companies, Biogen (NASDAQ: BIIB), posted $10.8 billion in sales in 2015. Nevertheless, if robots become ubiquitous in the coming years and transform society in the ways many companies and analysts predict, Massachusetts could be well positioned as a leader in this sector. One of the keys for local leaders, the report said, will be capitalizing on rapid advances in related technologies that are already boosting robots’ capabilities, such as sensors, cloud software, and artificial intelligence. —The state’s robotics cluster features a wide range of products. 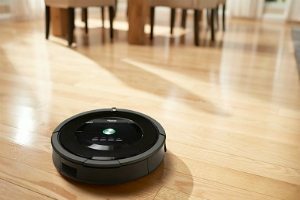 They include iRobot’s floor-cleaning machines (a Roomba is pictured above), CyPhy Works’ drones, Rethink Robotics’ factory robots, QinetiQ’s military robots, Amazon’s warehouse robots (from Kiva Systems), and Vecna Technologies’ robots used in healthcare settings. —Manufacturing is the largest target market for local robotics firms, followed by the defense and healthcare industries.